Oil on board, 14" x 20"
the adobe architecture, the sagebrush, the mountains, they all inspired me as a subject matter." He explained his art as, “The painter must first see his picture as paint-as color-as form-and not as a landscape or a figure. 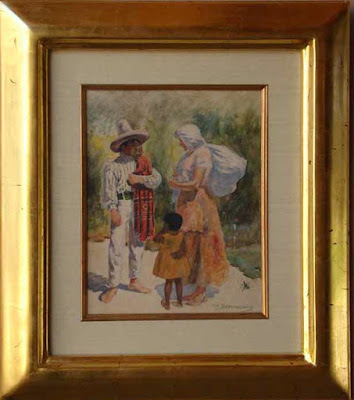 He was a Painter, Illustrator, Muralist and Lithographer. His art is categorized as Impressionism, Realism, Representationism and Naturalism. along with Joseph Sharp, Bert Phillips, Ernest Blumenschein, Irving Couse and Herbert Dunton. 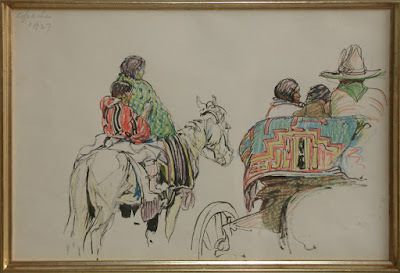 He was lauded by, "He ranks among the foremost of Indian painters of the country." a true psychological understanding of his major subject, the Pueblo Indians". Parsons does not offer Oscar E Berninghaus prints, because no print can compare to the real paintings. Oscar E Berninghaus was born in St. Louis, MO, on Oct. 2, 1874. He studied at the St. Louis School of Fine Art. He attended the St. Louis grammar schools and sold sketches to newspapers as a youth. He also created sketches of the river front in St. Luis, which he sold to tourists and newspapers. In 1889, at the age of 16 he quit school and instead went to work for Compton & Sons, a lithography company. In 1893, he started working for Woodward and Tiernan, one of the worlds largest printing companies. He took night classes in the Art Department of the School of Fine Arts at Washington University in St. Louis. In 1899, at the age of 25, he had his first one man exhibition at the Frank D. Healy Galleries in St. Louis. In 1899, he was hired by the Denver and Rio Grande Railroad to create a series of pieces of travel literature about New Mexico and Colorado. 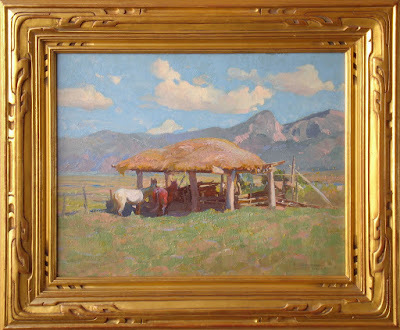 About his first visit to Taos, he said, "I stayed here but a week, became infected with the Taos germ and promised myself a longer stay…"
In 1900 he spent the first of many summers in Taos, New Mexico. He was one of the very few ever to gain admittance to the sacred kivas of the Taos Pueblo Indians. In 1900, Berninghaus had his first on man show. By 1905 his work was highly honored by the newspapers of New York, Chicago and San Francisco. 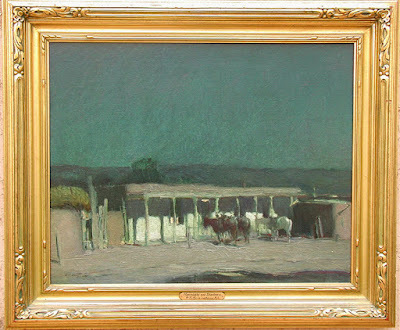 In 1912, he became associated with the founders of the Taos Society of Artists. 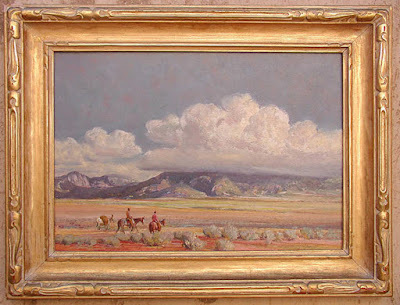 In 1915 he became one of the founders of the Taos Society of Artists. In 1919, OE Berninghaus bought an old adobe house on the Loma overlooking the town Taos. 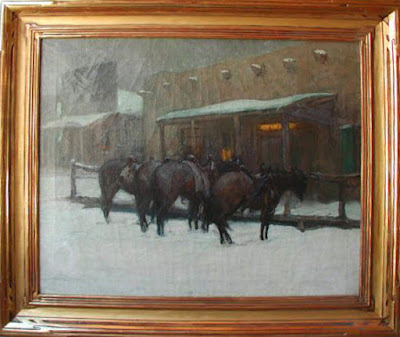 In 1925 he made his Taos residency permanent, allowing him to experience all four seasons in Taos. In 1931 he painted in the surrounding states, including a mural of the opening of the west for the Post Office in Phoenix, Arizona. in the federal courtroom in the Post Office Building in Ft. Scott in 1937. Oscar Berninghaus died in Taos, New Mexico on April 27, 1952, at the age of 77, three days after a heart attack. 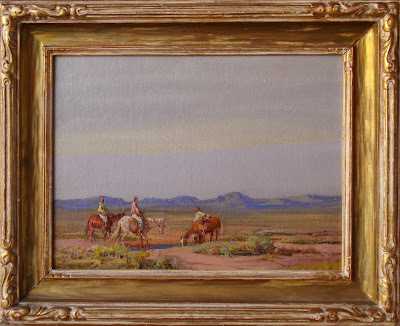 "John Dunn, Taos Stage Coach"
"A Fight For The Overland Mail"
"Friendly Indians Watching A Wagon Train"
"Attack on an Emigrant Train"
"Fight for the Overland Mail"
"In the Village of Lavacita, NM" Oil on Canvas Board, c. 1920, 16" x 20"
"Pitching Hay" Oil on Board, c. 1930, 10" x 12"
"The Green Leaves of Summer" Oil on Canvas, 20" x 16"
"Taos Pueblo and Indian" Oil on Panel, CIrca 1914, 8" x 12"
"Indian at Fireplace" Watercolor, CIrca 1900, 9" x 4"
"Around Taos" Oil on Board, 9" x 12"
"Taos Adobe Home" Oil on Panel, CIrca 1914, 8" x 12"
"Taos Mountain Riders" Oil on Panel, Circa 1930, 12" x 16"
"Church at Ranchos de Taos" 1920, oil on canvas, 28" x 28"
"Communication During the Period of Exploration"
"Surrender of the Miamis to General Henry Dodge 1814"
The 1926 Second Altman Prize from the National Academy of Design. "Spring Plowing" 1937 oil on canvas, 34 x 40 in. 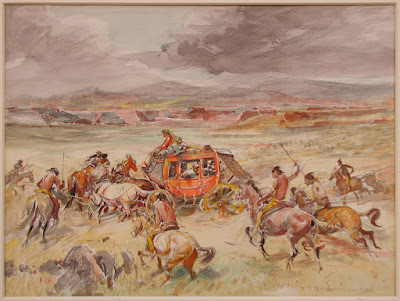 "Making Camp" ca.1930 watercolor 10 1/4 x 14 1/4 in. "Wood Haulers" n.d. woodcut 6 1/2 x 5 1/2 in.